At the heart of Barefoot Recording is a custom 60 channel UnderToneAudio™ console. With 24 busses, 6 aux sends, Flying Faders II Automation, and every channel outfitted with the custom UTA equalizer, it is the most versatile and musical analog console we've ever used. For monitoring, a pair of Urei 813c mains sit atop two custom sub-cabinets – complimented (or detrimented, depending on your worldview) by a pair of Yamaha NS-10s. Studio A's ever-evolving sound room houses the arsenal of Barefoot's musical amenities – from drum sets, guitars, amplifiers, and shakers, to the 9ft. Yamaha Grand Piano (For a full equipment list, click here). The live room of Studio A has dimensions that span approximately 35'x40' with a 16' ceiling. 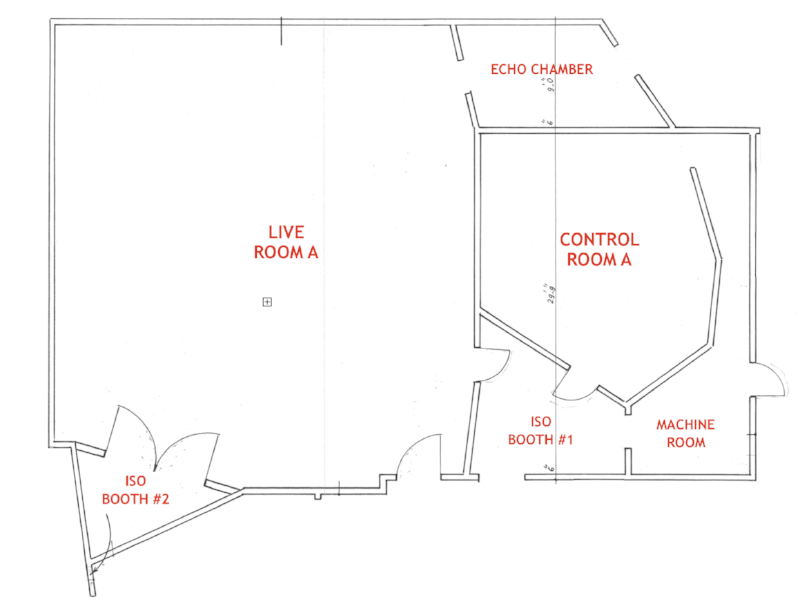 Combined with curtains surrounding and dividing the room, as well as numerous movable baffles, the room can accommodate the demands of most any type of live recording. Attached to the sound room of Studio A is a large isolation booth for a drier sound. For the opposite effect, an echo chamber adjacent to the sound room is conveniently accessible to capture a very lush, natural reverb. Our beautiful and versatile live room features two spacious iso booths, 16-channel Aviom headphone mixers, custom microphone positioning robots, baffles, moveable heavy floor to ceiling curtains, "live" and "dead" sides, echo chamber, and a fully adjustable drumbrella. The LC60 is the first console commissioned by UTA. It was designed and assembled at Barefoot Recording and currently holds a full time job in Studio A making records. In addition to the beautiful 9-foot Yamaha grand piano, Studio A also comes with a an array of outboard gear, including 2 UTA unfairchilds, an EMT plate, and access to Barefoot's collection of drums, guitars, keyboards and amps.